Whether you are traveling to El Paso for business or taking a much-deserved vacation, you demand more than just the amenities of home. You deserve tranquil and comfortable rooms, a professional, yet luxurious atmosphere, unsurpassed service, and elegant accommodations. No matter what brings you to the Holiday Inn Express Hotel & Suites El Paso I-10 East, your room is your personal retreat. Luxuriously decorated guest rooms and suites with a 42&reg plasma TV, pillow top beds and granite vanity will have you relaxed in no time. At the Holiday Inn Express Hotel & Suites El Paso I-10 East your lodging, service and convenience needs are met, and exceeded, without exception. 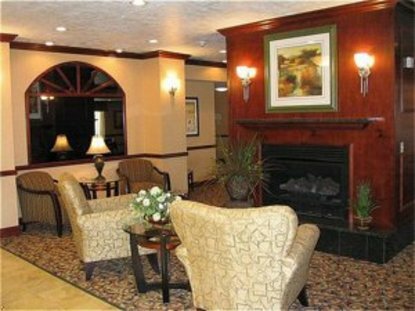 Traveling on business&reg The Holiday Inn Express Hotel & Suites El Paso I-10 East is the ideal destination. Imagine having all the space and tools you need for business, high-speed Internet, a specialized work area in your room and plenty of electrical outlets. A business center dedicated to our business travelers is also available.Traveling for pleasure&reg Enjoy Border Shopping at its finest - We are just minutes away from the Zaragoza Port of Entry into Juarez, Mexico as well as easy freeway access to El Paso&regs newest shopping district, The Outlet Shoppes.The best of El Paso is awaiting you at the Holiday Inn Express Hotel & Suites El Paso I-10 East Welcome home. This hotel is committed to providing accessible facilities under the American Disabilities Act. If your accessibility needs are not met, please contact the Hotel Manager on Duty. Should you require additional information regarding accessible facilities for guests with disabilities, please call 1-800-Holiday (U.S. and Canada) or contact the hotel directly. For the hearing impaired, TDD service is available at 1-800-238-5544 within the U.S. and Canada.